Photo: Acinetobacter on MacConkey by Iqbal Osman. Guest bloggers Dr. Rossana Rosa and Dr Silvia Munoz-Price write: The relationship between patients and their hospital environment is obvious yet intangible. What do we mean by environment? We are talking about the room, and objects within the room such as bedside tables, bedrails and IV pumps. In our study, which was published in the recent ICHE special edition, we found when patients are exposed to rooms contaminated with Acinetobacter baumannii they have an increased risk of acquiring this organism during their index admission. This association remained strong even after controlling for other variables. In a previous study1, we addressed the other side of the equation, and reported the high degree of contamination detected in the rooms of A. baumannii positive patients. We found that the paired isolates had similarity by PFGE of at least 94.8% with each other, thus suggesting a direct contamination of the environment from the A. baumannii positive patient occupying the room. Put in perspective, the results of these two studies highlight how close, dynamic and interactive is the association between patients and the hospital environment. Interestingly, we found two variables to be ‘effect modifiers’. An effect modifier is a variable that differentially modifies the observed association between an exposure and an outcome. 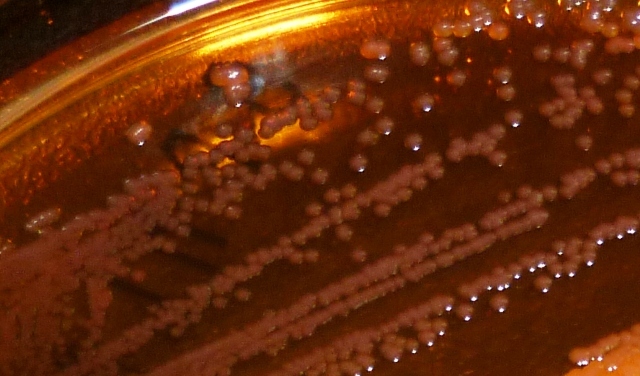 Despite finding a very strong association between exposure to a contaminated environment and acquisition of A. baumannii in the whole cohort, this association was rendered non-significant when evaluated in sub-groups admitted either to a unit with high colonization pressure or admitted to the trauma intensive care unit. This is relevant because colonization pressure has been shown to play a role in the horizontal transmission of CRE2, as well as VRE3, MRSA4 and C. difficile5. This poses the question of whether contamination of the environment could be primarily a result of the colonization pressure within a unit, to the extent of reaching a threshold after which most of the surfaces in a unit will be contaminated. The good news is that the exposure to a contaminated environment should be a modifiable risk factor for the acquisition of CRE and MDRO. Active surveillance cultures can be performed to screen for carriers, colonization pressures can then be estimated for each unit, and high touch surfaces can be determined and targeted for cleaning. 1. Munoz-Price LS, Namias N, Cleary T, et al. Acinetobacter baumannii: association between environmental contamination of patient rooms and occupant status. Infect Control Hosp Epidemiol 2013;34:517-520. 2. Swaminathan M, Sharma S, Poliansky Blash S, et al. Prevalence and risk factors for acquisition of carbapenem-resistant Enterobacteriaceae in the setting of endemicity. Infect Control Hosp Epidemiol. 2013;34:809-817. 3. Bonten MJ, Slaughter S, Ambergen AW, et al. The role of “colonization pressure” in the spread of vancomycin-resistant enterococci: an important infection control variable. Arch Internal Med 1998;158:1127-1132. 4. Merrer J, Santoli F, Appere de Vecchi C, Tran B, De Jonghe B, Outin H. “Colonization pressure” and risk of acquisition of methicillin-resistant Staphylococcus aureus in a medical intensive care unit. Infect Control Hosp Epidemiol 2000;21:718-723. 5. Lawrence SJ, Puzniak LA, Shadel BN, Gillespie KN, Kollef MH, Mundy LM. Clostridium difficile in the intensive care unit: epidemiology, costs, and colonization pressure. Infect Control Hosp Epidemiol 2007;28:123-130. 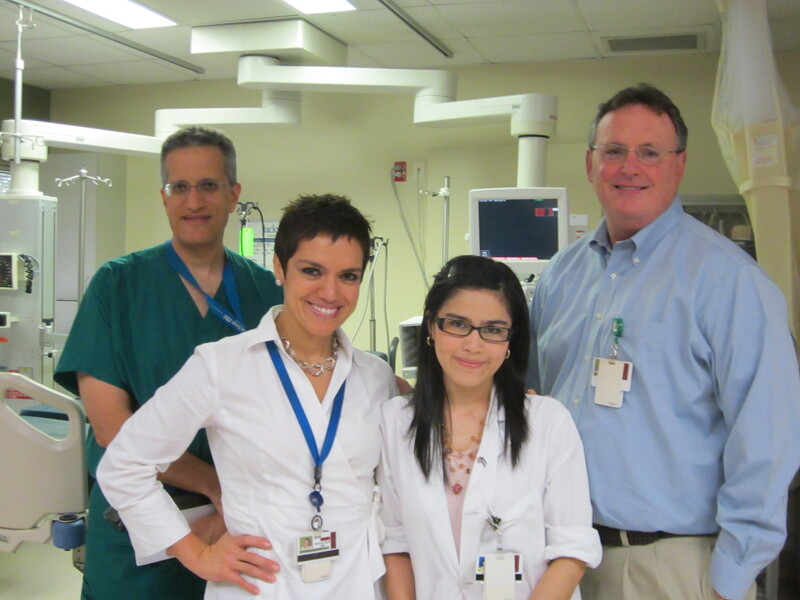 Photo key: from left to right: Dr. Nicholas Namias, Dr. Silvia Munoz-Price, Dr. Rossana Rosa and Dr. Daniel Kett. Location: Trauma Intensive Care Unit. Dr. Silvia Munoz-Price is an Associate Professor of Clinical Medicine at the University of Miami. Dr. Rossana Rosa is currently an Internal Medicine Resident at Miami Miller School of Medicine and an incoming fellow of Infectious Diseases at the same institution. She hopes to continue developing her career in Hospital Epidemiology and Infection Control. Thanks for this excellent post. It’s interesting that exposure to surfaces contaminated with MDR A. baumannii increased the risk of acquisition by almost 3-fold. Although the design of your study was fundamentally different, it is interesting to note that the increased risk from admission to a room previously occupied by a patient with MDR A. baumannii was also around 3-fold in a previous study (http://www.ncbi.nlm.nih.gov/pubmed/21054665). I am not sure that I completely understand the implications of your statistical findings. Am I correct in saying that the contaminated environment was a significant predictor for acquisition when controlling for all variables (including colonization pressure and unit) in the full analysis, and only became non-significant in sub-analyses restricted to high colonization pressure units and the Trauma ICU? The question of whether colonization pressure (rather than environmental contamination) is the main driver for acquisition reminded me of a related question – whether there is a causal relationship between contamination of the environment and the risk of transmission: http://www.micro-blog.info/2013/09/is-there-a-causal-relationship-between-contamination-burden-and-transmission-risk/. the multivariable analysis showed a significant association between exposure to a contaminated environment and acquisition of A. baumannii. In a subsequent analysis, we stratified the population based on 1. presence of a colonization pressure greater than 10% and 2. location in the TICU. When either of the two conditions was met, the association between environmental contamination and acquisition of A. baumannii was no longer present. Therefore, these two variables were deemed to be effect modifiers and consequently they were not to be included in the multivariable analysis. The role of colonization pressure in acquisition and transmission of pathogens is very interesting, and will continue generating questions. Thank you Jon, for the excellent information. Study after study is confirming the logic that environmental microbial loads having a direct effect on infection rates. We applaud the work here by Dr. Rossana Rosa and Dr Silvia Munoz-Price which is a finely controlled study tying specific bacterial species found on contaminated surfaces to acquisition. We note the difficulty of studies in the ‘real world’, and the multitude of variables at play, including colonization pressure and variation in environmental cleaning, hand hygiene, even physical differences in the built environments we inhabit. Off the top of my head, the one thing that instantly comes to mind are medication carts. They go from room to room and back to the nursing station four times a day, each day, every day.